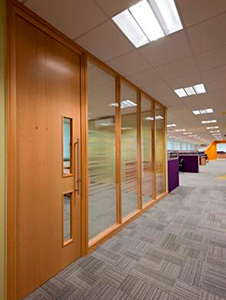 Komfort specialises in the design and production of commercial glazed and solid partitioning, laminate and veneered doors, movable walls, storage wall and washrooms. 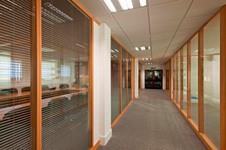 The company is the UK’s leading provider of partitioning systems and provides solutions to the commercial interiors sector which are compliant with current Building Regulations and suitable for any office fit-out or refurbishment. Komfort offers thirteen partitioning systems throughout the range which comprises of movable walls, sliding partitions, demountable partitions, glass, laminate and veneered doors, washrooms, ceilings, blinds and graphics. The company can produce any style required from traditional through to modern contemporary. All the partitions feature fire, acoustic and structural performance through stringent and rigorous testing. Komfort provides clients with a wealth of support services throughout the whole duration of the project. Services include estimations, full design and project visualisation, technical support, web accessible technical documentation including junction drawings in CAD and PDF formats, certification and installation statements, sales support, site surveys for glass and blinds, product installation training, NBS specifications, specifiers support line and RIBA approved CPD seminars. Komfort has showrooms located in the UK which are used by architects, designers, contractors and dealers who are looking for project inspiration when creating a workspace.